Not long ago, I received an email from Kelly, who was working to come up with a gift for her mother's upcoming golden anniversary. She wanted to honor her mother on such a special day but also acknowledge her father, who had passed away. She had the touching idea to have her mother's wedding bouquet recreated in silk flowers as well has her father's boutonniere to place at his grave. I was honored to be asked to create such meaningful and gifts. Kelly had to be sneaky and take cell phone pictures of her mother's wedding photographs without raising any questions. I received the pictures and got to work. We changed a few aspects of the original design to account for this becoming an arrangement for a vase. I also added sheer gold ribbon since it's the golden anniversary. Take a look! Marriage is something to be honored and upheld, despite death. I love that Kelly desired to honor both of her parents and their marriage with such a special and heartfelt gift. If you are still looking for that perfect anniversary gift having your wife/mother/sister's wedding bouquet recreated in silk flowers is a great option. Contact me to order yours! I got an email from Nick just a few shorts week ago. He had been on the search of a unique anniversary gift for his wife and came across my blog post of a bouquet recreation I had done a few years ago. Nick sent pictures from his wedding day in a variety of angles so I was sure to catch the various details. With photographs in hand, I set to work on the bridal bouquet recreation using high quality, fresh touch Roses, Baby's Breath and satin ribbon. Here's how it turned out! Bridal bouquet recreated in silk flowers. Contact us, a Minneapolis-based silk florist, to find out how to be a better gift giver. When my wife and I were married, we decided that, going forward, we would exchange “traditional" anniversary gifts. This choice has proven to be fairly easy some years and VERY difficult on others. This past anniversary was a difficult one as it was our twelfth, in which the traditional gift is silk. 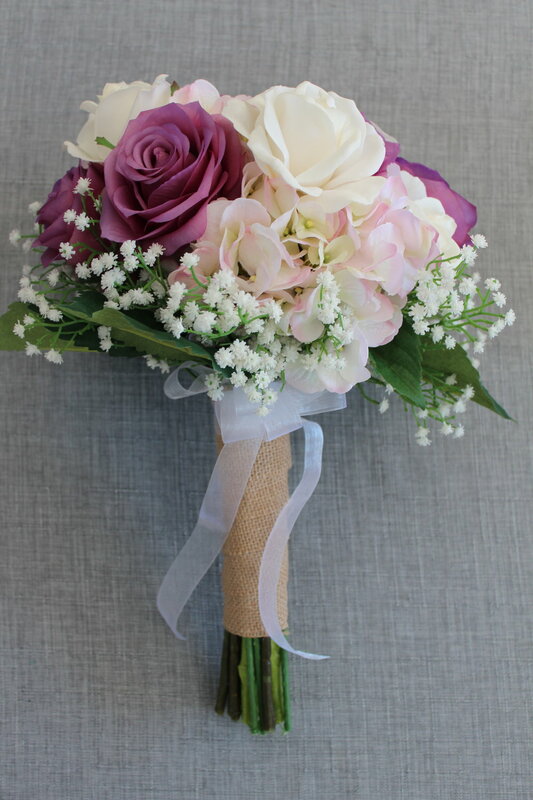 I decided that I wanted to have my wife's wedding bouquet re-created in silk, if I could find someone to do such a thing. After finding Erin's silk wedding flower website and having a short phone conversation with her, I was confident that I was putting this task in the right hands. Like I usually do, I had procrastinated in planning my gift but Erin had no problem getting it done for me in a short time frame, even though I knew that she had other jobs that she had to get done. Erin texted me that the bouquet was done. I was thrilled at the result when I went to pick it up! I could not believe the attention to detail and how it looked exactly like the original, live wedding bouquet. What's even more amazing is that she did all this with only a few wedding photos to refer to! In addition, I was very pleased and surprised at how reasonable her rates are. I had set aside quite a bit more money than it actually cost me. If anyone has an upcoming occasion where silk flowers could be used, I would very highly recommend Erin. They will not be disappointed! She is very reasonable, timely, and most of all her quality and attention to detail is top notch! Thanks again to Bob for giving me the opportunity to be a part of their inspiring story. Because as much as I love weddings, I'm more about the marriage and that's what this whole thing was about. Many more happy years to you Bob & Sue! One of the greatest benefits of silk wedding flowers is that you get to keep them for the rest of your life! But if you chose a fresh flower bouquet to carry down the aisle, take comfort in the fact that you could someday have your bouquet recreated in silk to treasure forever. As I mentioned yesterday, I received a phone call a few months ago from Bob, a local guy who was trying to pull off a wonderful anniversary surprise for his wife. Bob and I met so he could show me pictures of the bouquet his wife carried at their wedding. He wanted to give a traditional gift and when he looked up what it would be for a 12th anniversary he found that it was silk. He got the brilliant idea to have her bouquet recreated in silk flowers. Genius right?! This was such a fun project! Bob could only chat with me by text so that his work-from-home wife wouldn't accidentally see his email. I was able to text him pictures for approval and set up the pick up for a few days before he gave her this thoughtful and romantic gift. Bob was kind enough to text me after he had given her the bouquet and said she, "loved the flowers!" and, "she couldn't believe how much they actually looked like her bridal bouquet." He also said, "You scored me some huge points for that one, which is really hard to do as a guy!!!" Awesome, right? Glad to help, Bob! If you are looking for an anniversary gift, this is the perfect option. Contact me to find out what it might take to have a bouquet recreated. Tomorrow I've got a testimonial from Bob about his experience working with me. Thanks again to Bob and his wonderful bride for letting me share their touching and inspiring anniversary story. A few months ago I received a very interesting phone call that resulted in what you see here. Check back tomorrow to hear the whole romantic story!